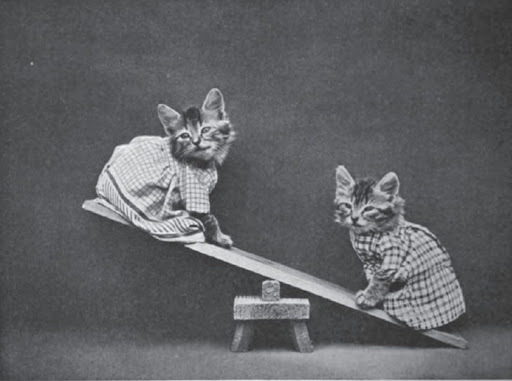 The Father of #Cat Photography: A Wonderland History – Imagine Classic Literary Characters living in the Modern World. Read Jane Eyre Gets Real, a Novel by Annabelle Troy, available on Amazon! 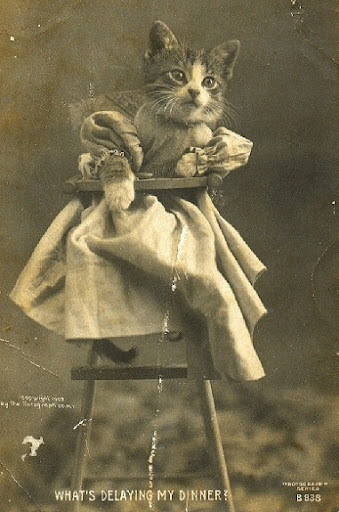 If owning cats delighted the Victorians so did photographing them. The father of pet photography, and the precursor to all four-legged twitter memes, is widely acknowledged to be Harry Whittier Frees. Frees, born in 1879, was an American who began to photograph cats when a paper hat accidentally drifted onto a feline’s head at a party, creating an instant “cute” moment that just had to be captured. From there he went on to produce postcards and books of kittens in adorable poses, doing such human things as stirring jam, hanging laundry and learning lessons, all dressed up in costumes made by his housekeeper and bearing LOL-worthy captions. Since Frees had to work with a very slow exposure and cats are notorious for wriggling around, his profession was stressful–only 30 negatives out of a 100 could be used and he worked only 3 months a year, allowing himself to restore his nerves during the other nine. Though Frees did eventually move on to dogs and rabbits, they proved to be no easier as subjects. In 1953 Frees, who never married or had children, was diagnosed with cancer and committed suicide alone in Clearwater, Florida. Unfortunately–or perhaps fortunately–he didn’t live long enough to see his art form become a popular amateur pastime.